I currently use SkyDrive to save all my office documents, pictures, and videos. I also bought a 64gb sd card that I have literally nothing on. With the limited space available on the cheapest Surface 2 (which is what I have), how can I utilize SkyDrive and MicroSD effectively? I plan to save documents that I want to access from different places to SkyDrive, like I do now. I plan to save video and music to the microSD card. Normally Music and Videos go into my SD card. Skydrive is used to backup pics and documents i make and also which i might need to access remotely. I moved my Skydrive folder to my sd card and made the whole thing accessible offline. It rocks. HeyCori, dgr_874, Wendy Haylett and 1 others like this. This is exactly what I intend to do as soon as Amazon is kind enough to deliver my SD Card! While I won't have my entire SkyDrive on the SD card, but the files that I make available offline should be there and that itself would be around 20GB. The rest would be local documents and videos - no music though. Thanks! What do you mean 'open the notification'? Oh...OK. I'll keep an eye open for this. Thanks again! Go to the recycle Bin on the desktop and right click for properties. Let me know if "Display delete confirmation dialog" is checked or not. Would it be possible to use "storage spaces", to just make the SD card part of the system storage? I don't think it is currently possible, since "storage spaces" cannot be used with the Windows drive. It is also not currently available on my Surface 2. 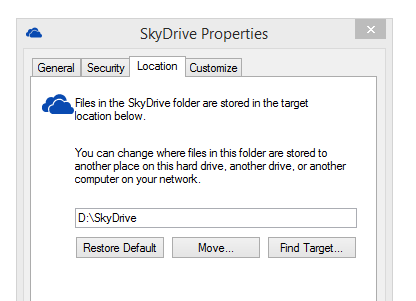 Before you relocated SkyDrive to the SD Card, did you make the SkyDrive folder on the SD Card or was it made by the OS during the relocation process? Did you do anything else to the SD Card prior to? Thanks for your post! I use the SD card store all my Video folder. I don't understand what you did or why. Can you explain? First, format the SD card to NTFS. Third, right-click on the default Skydrive folder (which is NOT the one that you created on your SD card). Then follow the steps as described in the image in post 4 above. Why do you choose Windows Phone?